We are very excited to announce a wonderful new item for our Yangchun families, with all proceeds going to the Yangchun Development Fund! When we learned about this English DVD, we knew it would be worth the effort to try and find more of them for our families. Call it luck or a miracle, but after much persistence, the Egan family was successful in tracking down a large quantity of these DVDs (thanks to a great deal of help from Mrs. Yu, Mr. Chen and a good friend in Yangchun). 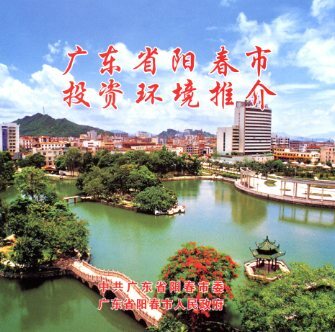 So at this time, we are overjoyed to be able to offer this unique DVD to our Yangchun families. 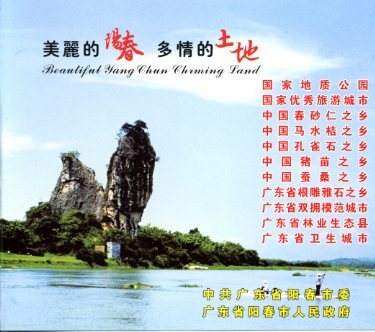 "Beautiful Yang Chun Charming Land" is a promotional DVD with a great deal of scenery from the Yangchun area. It also gives a nice overview of the various industries in the area. It runs 10 minutes long and has English subtitles. This is an original China produced DVD in a hard jewel case. It is in PAL format. We have tested this DVD on several computers and DVD players of various ages and manufacturers - some worked fine, and some would not play. So, we will also be including a copy of the DVD in NTSC format which should play on any player in the US. If for some reason you can not play the DVD, we will refund your payment after it is returned. The cost is $20 per DVD and includes both copies and postage within the US and Canada. For international orders, we have to add a small amount for postage due to higher costs. Please contact Betsy Egan and she can give you an exact price based on quantity and mail service requested. For more information, contact Linda Fielding or you can print an order form and send it and your payment directly to her. (Please note: The order form is a .pdf file. If you can not open or view the file, you may need Adobe Acrobat Reader. Acrobat Reader is a free software and can be downloaded at Adobe's web site. You may also pay by credit card, debit card, paypal funds or bank transfer by clicking on the "Buy Now" paypal link below. If you use paypal for your order/payment, please send Betsy an email and let her know you have placed an order via paypal.